THE HYPOTHESIS OF DEATH IS CONSIDERED. After Krugel's unsuccessful visit, our English colleagues vaunt the work of their specialist dog team from the South Yorkshire Police Department of Criminal Investigation. Their dogs are specially trained to locate the most minute traces of blood and are capable of outstanding performance in the search for human remains and bodily fluids. It's July. The hypothesis of death, including by the parents, is being seriously considered. However, no lead has yet come to anything, and we find ourselves in a cul-de-sac. We have to re-centre the investigation around its point of departure, apartment 5A at the Ocean Club, in Vila da Luz. We officially request the help of the best experts in criminology and forensics but also the specialist dog team from the English police. A few days later, we welcome Mark Harrison, a specialist in murder, and the search for missing persons and victims of natural disasters. National advisor to the British police, he is well known for his exceptional professional experience. He has already participated in dozens of international criminal investigations. His work consists of defining new strategies for research. He gets to work immediately, supported by the Portuguese PJ and the investigators from Leicester and Scotland Yard. On his arrival, we place at his disposal details of the case, as well as all our material and human resources. Harrison reads up on the statements and interviews from the principal witnesses - including, of course, those of the parents and friends -, all the analyses, simulations, hypotheses and cross-checking already carried out. He carries out a reconnaissance on the ground, by helicopter and then on foot. He paces the streets and the access roads to Vila da Luz and compares them to the diagrams created in the course of the investigation. Nothing is left to chance: measurement and timing of possible routes between buildings, apartments and restaurants; analyses, with the help of the best specialists, of weather, geological and maritime factors in relation to the investigation; consultation with the best forensic anthropologist in the country, who indicates for us what would be the actual state of the body in the hypothesis of death occurring on May 3rd; study of the region's natural carrion predators. All the research already conducted by hundreds of people - GNR, civil defence, firemen and other volunteers - is re-examined in detail and re-analysed. Great Britain has at its disposal the world's biggest data bank on homicide of children under five years old. Since 1960, the count is 1528. Harrison is well acquainted with its contents. He often draws information from there which helps him to resolve similar cases. Valuable information can be found there on on various criminal modus operandi, places where bodies are hidden, techniques used to get rid of a body. He relates that on one occasion, thanks to the data, he was able to deduce the maximum distance a body might be found in relation to where the crime had been committed. He suggests that we start the operations with the inspection of apartment 5A, then those occupied by the McCanns' friends. Robert Murat's house will also be subjected to thorough examination. In addition, all the vehicles used by all of them will be sniffed by the dogs. Meanwhile, we were supposed to receive American electronic equipment that detects human bodies thanks to the odour that emanates from them (Scent Transfer Unit 100). But the equipment, blocked by customs, arrived late. We didn't need to use it, having obtained very concrete results, thanks to the dogs. 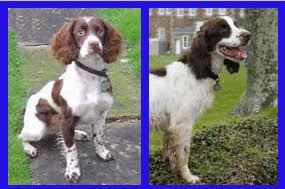 The heat is scorching on this thirtieth day of July 2007 when two Springer Spaniels, Eddie and Keela, get off the British Airways plane, accompanied by their trainer, Martin Grime. An air-conditioned vehicle is waiting to take them to their accommodation. A vet, who will be on hand during their stay, has been brought in to intervene in case of illness or if the dogs get bitten by a snake. Their mission: to find Madeleine's body and expose those responsible. Keela, a scenes of crime specialist, is capable of locating particles of blood even after a place has been cleaned with chemical products or bleach. 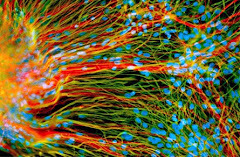 Sometimes, the residues are so microscopic they are missed by the instruments of the forensic police, as sophicticated as they are, and it's impossible to harvest them without taking all of what they are on. Eddie is always the first to be brought onto a site. Once he has discerned the odour that he knows so well, it's Keela's turn to go into action, on the lookout for the slightest whiff of blood. The simultaneous presence of the two elements in a given place - blood and cavaver odours - is taken to indicate that a body has been there and that it's probably there that the death occurred. The dogs' CV is impressive. Besides collaborating in hundreds of investigations, they passed the practical tests brilliantly at the FBI's "Body Farm," the only place in the world where human cadavers are used to simulate homicide scenarios and concealment of bodies. Amongst the most media-covered cases, which they contributed to resolving, is that of the disappearance in Northern Ireland of Attracta Harron, who was last seen when she was returning home on foot, after having been to church. All searches carried out by the police were unsuccessful. The main suspect's car having been totally burnt out in a mysterious fire, couldn't be examined. They called in Eddie, who examined the charred remains of the vehicle and immediately picked out the characteristic odour. Human tissue was found amongst the debris, the DNA of which corresponded to the missing woman. Later, the dog indicated the place - close to a river - where the victim's body had been abandoned. At the home of the suspect, where the police were searching for incriminating evidence, Eddie identified cadaver odour in one of the bedrooms. The man confessed to having killed the woman then moving her body to the banks of the river. The case of Amanda Edwards, reported missing, is also very impressive. The police, who conducted a search of her ex-partner's home, found small bloodstains there, but no trace of a body. The dog, who was brought in for the examination of the man''s vehicle, alerted to cadaver odour on the tools stored in the boot (a shovel, a level and a compactor). The police went to the building site where the suspect had worked a few days before and discovered the body, buried in a garage. The murderer had made efficient use of his tools to carry out his task. It's also thanks to the help of the dogs that the case of Charlotte Pinkley, a missing British woman, who had been imprisoned by her ex-partner, was resolved. The police requested the help of the specialist dog team to try to find the young woman's body. Eddie picked out a place where the abductor had provisionally left his victim. In the surrounding area, the investigators found the button from a dress that had belonged to Charlotte. That clue exposed the murderer, who ended up showing the police the place where he had hidden the body. More recently, it's Eddie who helps to find a body buried under a flagstone at the former orphanage, Haut-de-la-Garenne, in Jersey, setting for a terrible case of paedophilia and child murder. The achievements of the dog detectives are the result of a very long apprenticeship. It all starts with the selection of the best puppies when they are only a few months old. The most talented breed for this unusual "profession," is the Springer Spaniel. The trainer, Martin Grime, and his pupils undergo aptitude tests every year in order to obtain certificates proving their capability. In Great Britain, the police have no hesitation in calling in the specialist dog teams to assist in certain criminal investigations. Their skills are nowadays recognised by journalists, police and courts all over the world. On August 3rd 2007, I am having dinner in Praia da rocha, near Portimão, with my friend Gaivota. Unable to hide my anxiety, I keep looking at my watch and my telephone. Gaivota asks me if everything is OK: I respond with an absent-minded "Yes." A few kilometres away one of the most important search operations ever carried out in Portugal has begun. Perhaps we will finally manage to clear up the mystery of Madeleine's disappearance. The investigation starts in apartment 5A. The grey jeep transporting the dogs pulls into the car park in front of the building. There is hope and anxiety on people's faces. Martin Grime gets out of the car, holding Eddie on a tight leash. He takes it off and orders Eddie to sit down. Instead of obeying as would be expected of such a well-trained dog, Eddie immediately rushes into the building. He then goes to and fro between the lounge and the bedroom in an agitated manner. Martin wonders what could be making his animal so nervous and calls him back to give precise orders. An investigator is filming the entire scene. A little later, Eddie is examining the floor in the parents' bedroom, near the wardrobe, when he lets out a strident howl, indicating that he has detected a cadaver odour. The investigators have hardly recovered from their amazement, when another, equally impressive, howl startles them. This time, Eddie has picked out that same odour under the window, just behind the sofa, on one of the walls in the lounge. That evening, in apartment 5A, the investigators begin to glimpse what might have happened. Then it's Keela's turn to intervene. She points her muzzle at the same place where Eddie gave the alert: traces of blood are found on the tiling between the window and the sofa. Outside, Eddie barks twice: on the veranda at the back of the building and in the garden, just below it. At this place, the dog's bark is weaker and might mean "maybe, who knows....". Thus from the indications provided by Eddie, we can pinpoint the places where the body was moved around. Apartments 5B, 5D and 5H, where the McCanns' friends stayed, are examined that same night. The investigators are expecting new developments. However, nothing happens. Eddie does not show the slightest reaction. Therefore, Keela does not get involved. EXAMINATION OF THE McCANNS' HOUSE. "The moment of truth has arrived." That's what everybody is thinking when searching begins at the accommodation the family is occupying from now on: either we find evidence of their responsibility in Madeleine's disappearance, or they will definitely be cleared of all suspicion. To avoid contamination of evidence that will be gathered at the McCanns', Mark Harrison has insisted on the availability of decontaminated premises exclusively set aside for this purpose. Julio Barroso, mayor of Lagos, agrees to lend us the garage of a new, unoccupied building in the centre of Lagos. The place is cleaned from top to bottom. On August 2nd, at 6pm, the inspectors arrive at the McCanns' residence and present the search warrant. The principle of the examination by the specialist dogs is explained. Kate and Gerry are in the swimming pool in the garden with the twins. Contrary to all expectations, they allow us access to their house in a very natural way. Eddie goes immediately to the lounge. He comes to a stop in front of a wicker armchair on which is lying Madeleine's small pink soft toy, which Kate was never without in the early days of the investigation. Nowadays, she wears a rosary and a green ribbon around her neck. Eddie barks to let us know that he has detected an odour: the soft toy has been in contact with a body. The soft toy and all the clothes from the house are placed into boxes specially made to preserve evidence. These objects are then conveyed to the decontaminated premises. They are to be placed on the ground, a good distance apart for the dogs to examine. - How do I find a place at this kind of time? Julio Barroso offers us the new sports hall in Lagos which, finally, meets the required standards. The objects are once again laid out on the ground and the dogs can start. Eddie alerts us to a strong cadaver odour on some of Kate's clothes, but the CSI dog doesn't detect the slightest trace of blood. EDDIE AND KEELA AT ROBERT MURAT'S HOUSE. Robert Murat's residence and the adjacent grounds are gone over with a fine-tooth comb in their turn. Mark Harrison, rigorously professional, has planned to devote three days to this job. This seems long to us. We want to limit the duration of this operation to avoid having the media besiege the premises. Mark agrees not to prolong the search any longer than is necessary, and manages to finish it in two days. PJ, GNR, Civil Defence: dozens of men are mobilised. They have to work their way through the jungle that's invaded the land all round the house - Murat will not recognise his garden any more once the investigators have been through. The ground is examined with radar, centimetre by centimetre, by a specialist from Aveiro university. In vain: the dogs detect nothing. No evidence is found anywhere within the area examined. All the same, the radar reveals that Murat's house is built over an ancient Roman villa. Not having been able to find an available garage in Lagos, we appeal to the mayor of Portimão, Manuel da Luz. In this case as in others before, the police have been able to count on the practical support of the mayor's office. Finally, on August 6th, in the unoccupied floors of an underground car park, opposite the PJ's offices, the inspection of the vehicles takes place. To be examined are those of Robert Murat, Michaela, Sergey Malinka, Luiz Antonio, the McCann couple, and one that Russell O'Brien may have used. Driven by the investigators, the cars are parked in the reserved areas, doors closed and windows raised, with a space of 10 metres from one to another to avoid contamination. According to planned procedure, Eddie goes in first; Keela will be brought in if necessary. In the immense underground car park, Martin commands Eddie to begin the examination. 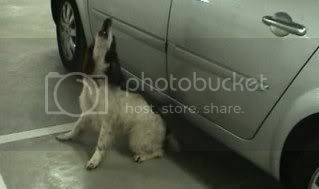 The dog then intensively sniffs each of the first three cars, at tyre level, the side doors and the boot, then all round. 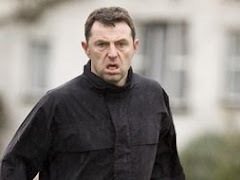 When he gets close to the fourth, the McCanns' Renault, he becomes agitated, raises his nose while running around, as if he is trying to locate the source of the odour he has detected. Martin tells him to stop running around and concentrate on the search. Finally, he starts to growl, bark and wanting to bite the bottom of the driver's door and the boot. The odour is coming from inside. The PJ's experts examine the vehicle for hours with the help of Keela. At dawn, traces of human blood are found in places indicated by the female dog: the key and the boot. The harvested samples are packed, then sent to a forensic laboratory in Birmingham, Great Britain. Eddie did not hesitate for a moment. He was only interested in the McCanns' automobile. No other attracted his attention or provoked any reaction whatsoever on his part. So, why would certain people want to minimise the evidence produced by this method? Later, I am brought the witness statement of a neighbour, according to whom, the McCanns left their car boot open all the time. For Gerry's brother-in-law, the bad smell was explained by the fact that the McCanns transported their bins in it. As for the blood, it had been left by a piece of meat fallen out of a shopping bag. Kate's cousin explained that the unpleasant smells were due to the little ones' dirty nappies. HARVESTING OF THE SAMPLES DERIVED FROM THE SPECIALIST DOGS' INSPECTIONS. So that the items of evidence might constitute admissible proof, the harvesting and packing must conform to the rules avoiding all risk of deterioration and contamination. It is experts from our police forensic laboratory who carry out the harvesting. The minuscule traces cannot be gathered in situ, so the tiling is gently lifted out before being transferred to the Forensic Science Laboratory in Birmingham. Photos bear witness to every stage of the operation. For added security, it is the expert responsible for the collection who takes them to FSS on the morning of August 7th. The choice of this laboratory is not insignificant. Apart from their use of cutting-edge technologies - LCN (Low Copy Number) a DNA identification test, used particularly when only microscopic samples are available -, the results, whatever they might be will not be able to be contested by the British since it's one of their most reliable laboratories. All other items of evidence gathered - the keys to the McCanns' car, hair and traces of blood found in the boot - are also sent to England. English and Portuguese police get together to analyse the results of Eddie and Keela's searches. - What we can deduce at this stage is that only the McCanns are implicated. The dogs did not detect blood or cadaver odour other than with them. - From now on we have the certainty that there was a body behind the sofa before being taken into the parents' bedroom. - If the blood found behind the sofa is that of the little girl, we can assume that she died there. - That could explain why the sofa was pushed up against the curtains. - In Madeleine's bedroom and on her bed, there was no cadaver odour. Thank you. Definitely a good chapter, well written, clear and just a straightforward outline of the investigation and the leads being followed. I've seen the E&K videos & knew all about their findings but it's really interesting to read Amaral's take on it. and also to learn of Gerry's drive by. I bet he cacked himself when he saw 5A was undergoing a search. And not many more to go now. Fantastic work. Thank you for bringing this book to us. Yes thank you for all your work. I have lit a candle to the financial diva to lighten your load. I was grateful to hear Amaral's version of the dogs searching. And also wonder if Mark Harrison is still involved at some level. I cannot see that anyone who saw what he saw could knowingly walk away from such a case. The time will come when the charade has to end but again I reiterate that everyone complicit in the cover up of this crime must be punished. That goes for the public relations, the family lies etc and most certainly any politicians who blocked vital information from being released. And I mean this from both countries. I agree. Anyone who has even watched the videos of the dogs can't really help considering that something serious was being picked up by them, especially, I think, when Eddie threw items of clothing in the air. Bless you, Su, for your very kind candle and thoughts. Thank you, Betty. Chapter 18 coming up very soon. I'm on the last two paragraphs. Then it's a matter of correcting the spelling, grammar and typos and I'll post it!! Always thought the secret lay in "Cuddle Cat". Carried as a "mask" of odour everywhere, like a Trojan horse...there for all to see .....and easily explained. Move a body one day...."Cuddle Cat" explains the smell from it's owner. Swimming pools also "mask". Now its getting interesting. You can tell I'm commenting as I read with my previous comments lol. Now the sofa pushed up against the curtains adds up, although if your trying to cover up a fall area you wouldn't push it up so it squashes the curtains and looks odd. Looking like she was upset, went looking for her parents, tried to climb and fell and they covered it up. Although why wouldn't she try the patio door which was unlocked and walk over to them. My kids would walk out to us at that age (still that age).